Few gardeners realize that the source of all black, green, and white teas is actually a type of camellia, known by the scientific name Camellia sinensis. Tea camellias have attractive flowers similar to other types of camellia and are occasionally grown as ornamentals though it's also possible to grow them for the purpose of harvesting your own tea. Tea camellias are evergreen shrubs that can grow up to 15 feet tall and wide though they are commonly kept smaller with pruning when grown for a harvest. The flowers are not as showy as some of the other camellias, but the 1 to 2 inch white blossoms are still quite attractive when they appear in late winter. The glossy green leaves are 3 to 4 inches in length and have serrated edges. The shrubs naturally takes on a rounded form with age, but can be pruned into a hedge of almost any shape. Tea camellias are not frequently found in garden centers, but can be ordered from online nurseries. Tea camellias are hardy in USDA zones 7 to 11. They grow well in partial shade or filtered sun and need acidic soil with excellent drainage if they are to thrive. Tea camellias are not drought tolerant, so plan to irrigate at least once each weak and maintain a thick layer of mulch around the plants to keep the roots cool and moist. Tea camellias are best planted from containers in fall when the weather is cool. Plant them as a hedge with about 4 or 5 feet between each plant, making sure the top of the root ball is even with the soil line. If necessary, plant on a mound to ensure good drainage and incorporate peat moss, sulfur or ammonium sulfate into the soil to bring the pH down below 7. Like all camellias, tea camellias prefer rich soil, so mixing equal parts compost with the planting soil goes a long ways toward keeping the plants lush and healthy. There are two main varieties of tea, Chinese tea (Camellia sinensis sinensis) and Indian, or Assam, tea (Camellia sinensis assamica). Both can be used to make green tea, black tea, white tea, though some of the other specialized types of tea, such as Darjeeling and Pu-erh, are traditionally made from one or the other. 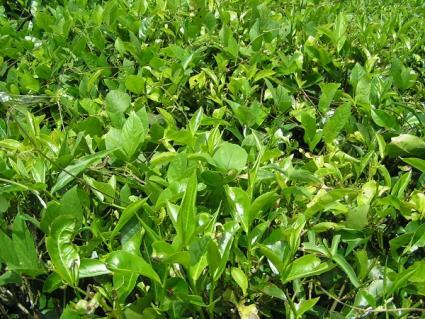 Assam bushes tend to be larger on average than Chinese tea bushes and slightly larger leaves. For the purposes of home cultivation, either variety will suffice. If your tea camellias exhibit yellow leaves with green veins - a condition known as chlorosis - it is a sign that the soil is not sufficiently acidic. Use one of the amendments mentioned above as a remedy if this occurs. 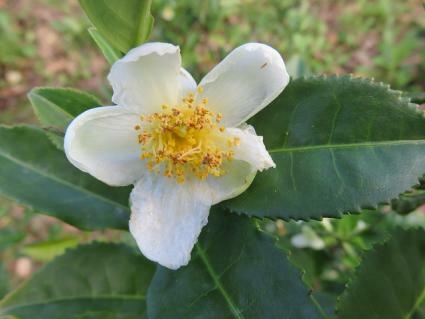 Tea camellias are generally much more resistant to pests and disease compared other camellias though fungal diseases and insects, such as scale and aphids, occasionally attack the plants. These are usually not serious problems on healthy specimens, so the best course of action is to provide optimal growing conditions and rely on the natural defenses of the plant to keep it healthy. 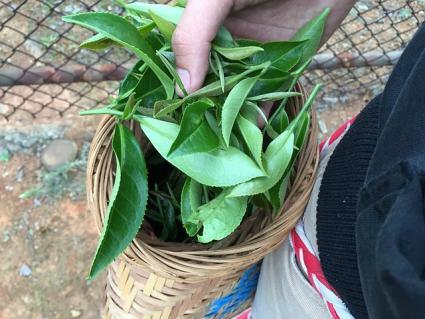 The harvesting and processing of tea has been perfected over the ages in Asia. While all types of tea come from the same plant, the harvest and processing methods vary depending on the type of tea you want to drink. Here's how to make three common varieties. Green tea - When the tea plant starts growing in spring, clip off the top few new leaves. Spread them out on a screen to dry in the shade for a few hours and then heat them in a steamer for a minute or so. Afterwards, dry them again in the oven at 250 degrees for 20 minutes or until the leaves lose their elasticity and break when bent. White tea - This is a lighter version of green tea. Use the same process, but harvest only the tender growing tips of the plants. Black tea - Harvest as per green tea, but roll the leaves between your fingers to bruise them until they begin to fade to a dark color. Dry them slowly in the shade for several days until they lose their elasticity. Always store dried tea in cool dark place inside an airtight container. You can continue to harvest new growth as it appears throughout the growing season. The making of tea is an art form unto itself with different expressions in different cultures. However, the basic method for home-harvested tea is to use a tea ball or tea strainer and infuse a pinch of dried tea per cup in just-boiled water for a minute of two. When the water is fully colored by the tea, remove the leaves, sweeten to taste, and enjoy. Of course there other garden plants that can be harvested for tea. Some, like jasmine flowers (Jasminum officianale) are often combined with the leaves of the tea plant for a delicious warm beverage. However, there are other plants that make tasty non-caffienated teas on their own. Mint (Mentha spp.) - Peppermint, spearmint, apple mint, chocolate mint, pineapple mint and other specialty mint varieties all make a refreshing tea and can be used either fresh or dried for both hot and iced teas. 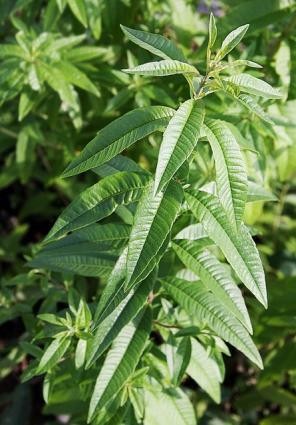 Lemon verbena (Aloysia triphylla) - A deciduous shrub up to 8 feet tall with fragrant leaves that make a zesty lemon-flavored tea. German chamomile (Matricaria recutita) - An annual herb with small white and yellow flowers that are renowned as a relaxing tea. From China to England, drinking tea has become a timeless part of human culture. Few people endeavor to grow their own, but it is surprisingly simple to do so, especially since the shrubs fit seamlessly into ornamental landscapes.